The late John Harrison, who was a keen rambler as well as being Chairman of Sutton Coldfield Civic Society, wanted to promote a ten-mile walk round the fringes of Sutton which he called the Sutton Chain of Footpaths. This was achieved in 1986 when the Birmingham City Planning Officer, Graham Shaylor, used a “Community Programme” scheme to signpost the route, repair the stiles, and produce a guide in the form of a leaflet called “The Sutton Byway”. The Byway started at Hillwood Road, missing out the first two miles of John Harrison’s chain, which started at Rosemary Hill Road. The first footpath of this chain starts between Regency Walk and 186 Rosemary Hill Road and leads to Blackberry Lane. Centuries ago there was no path here as this was part of Four Oaks Common, open heathland. In 1825 the commons were enclosed and this right-of-way was laid out, running along the boundary of several small fields. These fields were attached to cottages which originated as squatters’ huts, and they were rented from the Corporation by poor labourers and artisans. Two of the cottages were tenanted in 1811 by James Fisher and Samuel Pheasant, and these cottages are still there, greatly modernised and extended to make one dwelling. The path broadens out towards Blackberry Lane - the Enclosure Commissioner decided that this section should be designated Private Road No. IV, sixteen feet wide. Blackberry Lane was also laid out by the Enclosure Commissioner in 1825 - previously it was just a track across the common - but Clarence Road already existed, known as Long Lane. When John Harrison first walked this route he turned right along Clarence Road for a few yards to find the next path on the left, but as the area became more built-up the path was moved and is now opposite Blackberry Lane. It now leads to Bradgate Drive, a small housing estate built on what was once a common marl-pit. Local people could come here and dig out the clay to spread on their sandy ground and improve their crops; in 1825 it was included in a newly-enclosed field numbered 61 on the plan, but the customary right was retained. The Enclosure Award specifies that field number 61 was “subject to the right of the respective proprietors of lands and estates in the Parish of Sutton Coldfield and their tenants for their own necessary uses within the said parish to get and take away Marl”. The practice of getting marl had died out by 1856, when the marlpit is described as “Pool in Hill Hook Field”, but the customary right enshrined in the Enclosure Award may still be in force unless it was rescinded when Bradgate Drive was built. 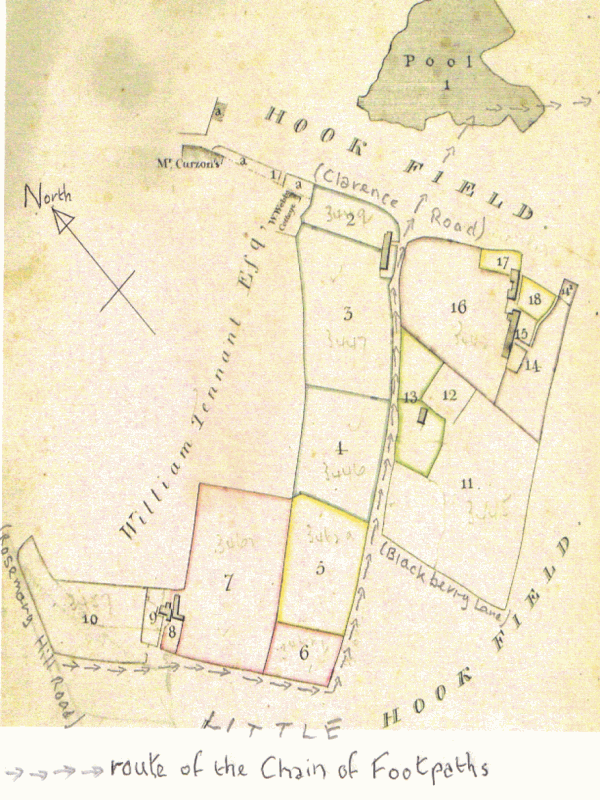 There is a plan of this area in the Corporation Survey of 1811, fourteen years before the commons were enclosed, naming this part of Four Oaks Common as Hook Field and Little Hook Field. To the left is part of the estate belonging to William Tennant Esquire of Little Aston Hall; the Corporation property is a cluster of small fields and cottages between Tennant’s lands and the commons. The numbers on the plan refer to a schedule, for example John Lucas was the tenant of the cottage in plot 17, his garden was plot 18 and his small field plot 5, all outlined yellow on the plan and totalling one acre; six other holdings are outlined in other colours. The route continues along a path leading from the southern end of Bradgate Drive in to the Hill Hook Local Nature Reserve, so designated in 2003, and on to the dam of Hill Hook Pool. A page from the 1811 Survey of Corporation Property.